The 36-year-old Belgian has won three of cycling's five monuments. 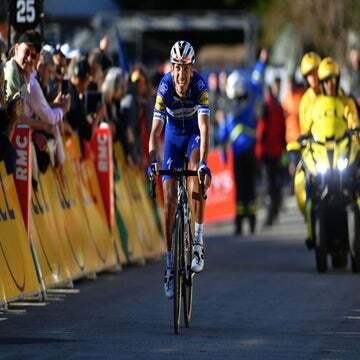 FLORENCE, Italy (VN) — Philippe Gilbert (Deceuninck-Quick Step), 36, is not thinking about quitting, but rather about winning monuments Milano-Sanremo and Paris-Roubaix. Gilbert turns 37 in July. Already, others from his generation have retired. Mathew Hayman (Mitchelton-Scott), 40, stepped away this weekend after the Santos Tour Down Under. However, the Belgian Gilbert is targeting big goals in his 17th season. “It is not easy to win all [five monuments], but I want to try it,” Gilbert told Het Nieuwsblad. Gilbert has won three of the five monuments: Liège-Bastogne-Liège in 2011, the Tour of Flanders in 2017 as the Belgian champion, and Il Lombardia in 2009 and 2010. All that remains for Gilbert is Milano-Sanremo, scheduled for March 23, and Paris-Roubaix on April 14. Winning just two more races might sound simple, but Gilbert has already spent years fighting to do so, with a recent emphasis on Paris-Roubaix. 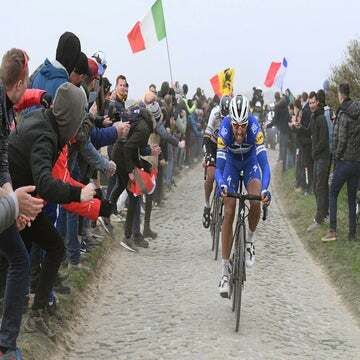 On Monday, Roubaix organizer ASO announced the seven wildcard teams that will race alongside the 18 WorldTour teams: Cofidis, Delko, Direct Énergie, Arkea-Samsic, Vital Concept-B&b Hotels, Roompot-Charles, and Wanty-Gobert. Gilbert’s Deceuninck team receives an automatic invitation because of its WorldTour status. Gilbert placed third behind Fabian Cancellara at the 2008 edition of Sanremo and was third again in 2011 behind Matt Goss. Last year, in his return to Paris-Roubaix, he was 15th. Only Eddy Merckx, Roger De Vlaeminck, and Rik Van Looy have won all five moments. Around 40 years have passed since the last time it happened. Irishman Sean Kelly almost did so in the 1980s and 1990s, but he retired after the 1994 season without winning Flanders. Gilbert’s contract continues through 2019, but he plans to fight for a few more years as he continues to chase his goals. “I still feel good and I like this work. For example, look at Alejandro Valverde: he is 38 years old, but he is a reigning world champion. Why should I stop?” Gilbert continued. “I am motivated still and I still like the training. I just like to ride, and I will continue to do it even if I am no longer a pro. Gilbert will make his season debut February 14 in France at the Tour de la Provence. Some of his teammates raced at the Tour Down Under, where Elia Viviani sprinted to victory in stage 1. “It also helps that I’m in a good team. With us the team spirit is good, we race aggressively, and we try to take the race in hand. That is important for me,” added Gilbert.